Here at Life Church en11, we believe meeting on a Sunday is important, but it doesn’t end there. Church isn’t something we do, but something we are. We are the church whether we meet on a Sunday, at midweek meetings and even when we go about our daily activities. That said, we also believe that Sundays are important as this is when we come and spend time worshipping God together. If you have never been to church before, here’s a summary of what we do on a Sunday; hopefully this will help in finding out a little bit more about us. Our Service starts at 10.30am with a friendly welcome and helps us focus on the time we have together. Songs – At Life Church we spend time singing to God. We primarily sing songs and not hymns and that’s not because one is better than the other, but because this is our preference. We sing because we love Jesus and want to tell Him that and thank Him for all He has done for us. It is often in our times of singing that we feel a sense of drawing closer to God. Talk – Each week we spend time listening to someone talk about something that God has placed on their heart to share from the Bible. We believe the Bible is a manual for life that can guide and lead us in all we do. So we’ll spend some time (usually around 30 minutes), focussing on what the Bible is saying to us and how we can use and apply this is in our daily lives. Communion – The Bible tells us that “For God so loved the world, that he gave his only Son, that whoever believes in him should not perish but have eternal life.” (John 3:16). Through taking communion we remember the sacrifice that was made to make a way for us all to be with God in heaven; forever. 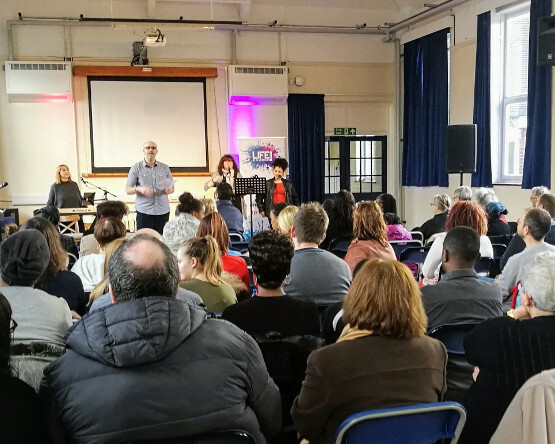 Giving – We ask all who count Life Church en11 as their home church to give and it is through this that we are able to do all we do. The offering goes towards materials used in church and for events, building costs, salaries and supporting various projects both within and outside the church. We don’t ask or expect visitors to give. Kids & Youth Ministry – most Sundays during term time we have a parent-led crèche, a childrens’ ministry called Ignite (for 5-11 year olds) and a youth ministry called Next:Gen (for 11-16 year olds). If you are visiting Life Church you are more than welcome to take your child along. If you would prefer your child to stay with you that is fine as well! All of our children’s workers have a current DBS certificate. At the end of the service (around 12pm) we have some refreshments and we’d love it if you could stay for a cuppa as it would give us a chance to get to know you. We know from the Bible that Jesus was fun and interesting and that’s what we are trying to make Life Church; a place that is fun, interesting, and most importantly, where we learn more about and grow closer to Jesus. Not every Sunday is the same so please come along and see what we are all about, we have people in our church from various backgrounds and cultures, but no matter where we have been or come from we are trying to head in the same direction by following Jesus and to be more like Him.